WILLIAM HENRY BAUER, a native of Texas, was born in Port Lavaca, Calhoun County, Texas, on February 14, 1907, the son of the late Capt. Frank E. and Elizabeth (Wiegand) Bauer. Mr. Bauer was co-founder of Bauer Dredging Co., Inc. and from 1936 through 1965 guided this small Texas company to a postion of recognized world leadership in its field. 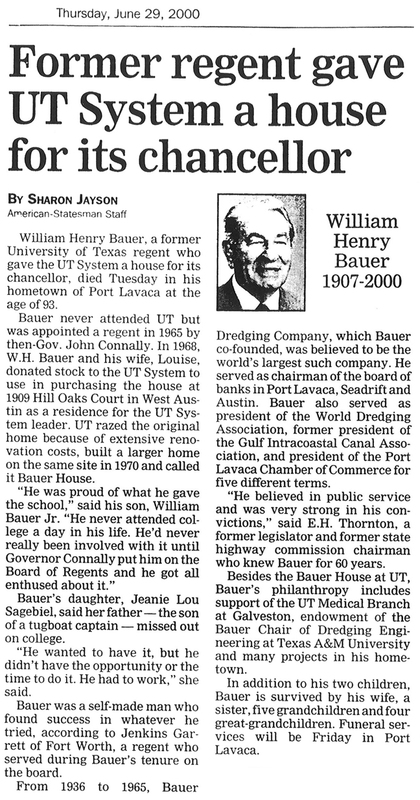 Until recently, Mr. Bauer was Chairman of the Board and Chief Executive Officer of Bauer Dredging Company, Inc. and its subsidiaries; was a former Member of the Board of Directors of the Panama Canal Company, and was elected President of the World Dredging Association at its annual meeting in Rotterdam, The Netherlands, in 1968, and was elected Chairman of the World Dredging Association in July of 1970. He is Chairman of the Board of the First National Bank in Port Lavaca, Texas, and Chairman of the Board of the Texas State Bank at Austin, Texas. Formerly, Mr. Bauer was: Director and Vice-President of Texas Gas Transmission Corporation, Vice-President, Director and Member of the Executive Committee of American Commercial Lines, Inc. Despite his busy schedule, Mr. Bauer has given freely of his time in the promotion of a better way of life for his home town, his state and his country. He has been extremely active in all waterways legislation and as a Director of the Gulf Intracoastal Canal Association for 30 years has been a dynamic force in the creation of this great inland waterways system and its continuation to Mexico. Mr. Bauer’s interest in waterway development is still very keen, and as the current Chairman of the Executive Committee of the Gulf Intracoastal Canal Association he continues his efforts for a better and greater system of waterways to meet increased demands. In 1965, Mr. Bauer was appointed by Governor John B. Connally as a member of the Board of Regents of The University of Texas System. Mr. Bauer, as Chairman of the Executive Committee, has, and will continue, until the expiration of his term in 1971, to give freely his best efforts to the promotion of higher education for the youth of his native state. As a Past President of the Port Lavaca Chamber of Commerce, Mr. Bauer has long supported the progress of his community and was primarily responsible in obtaining for Calhoun County its first large industry, the Aluminum Company of America’s complex at Point Comfort, which was destined to change this area from a sleepy fishing village to one of excellent industrial climate. As a rancher, Mr. Bauer owns and operates large ranches in Jackson and Calhoun Counties, Texas, which are well known for their progressive management and their use of advanced technology. Mr. Bauer is married to the former Louise Stjepcevich of Galveston, Texas, and maintains homes in Calhoun and Jackson Counties, Texas.